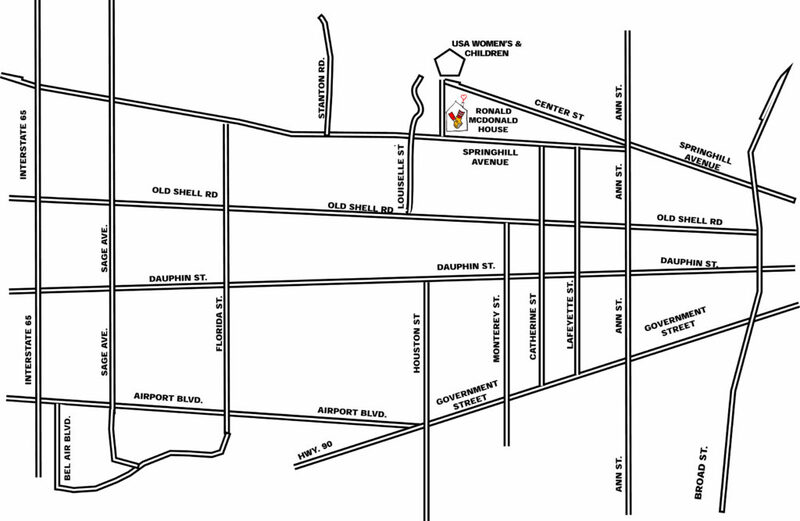 From Springhill Ave. and Broad St., drive west on Springhill Ave 1.3 miles. Ronald McDonald House of Mobile will be on your right. Travel east on I-10 towards Alabama. Merge onto I-65 North toward Montgomery (Exit 20). Take Exit 5A for Spring Hill Ave. Turn right onto Spring Hill Ave. and proceed approximately 3 miles. Ronald McDonald House of Mobile will be on your left. Travel north on US-98 to I-10. Take I-10 west toward Mobile. Travel 14.9 miles to Exit 20. Merge onto I-65 toward Montgomery. Take Exit 5A for Spring Hill Ave. Turn right onto Spring Hill Ave. and proceed approximately 3 miles. Ronald McDonald House of Mobile will be on your left. Travel west on I-10 towards Mobile. Merge onto I-65 North toward Montgomery (Exit 20). Take Exit 5A for Spring Hill Ave. Turn right onto Spring Hill Ave. and proceed approximately 3 miles. Ronald McDonald House of Mobile will be on your left.